To the astonishment of publishers, Jalaluddin Rumi has become the best-selling poet in America. Rumi’s sensational popularity is notable not only because of its content—an intoxicated, rapturous love letter to the divine—but also because his mystical poems were written in Persian in the 13th century. In this program, we hear Michael Green, a gifted artist and author (his images adorn this page), whose work has illustrated such best-selling books (with Coleman Barks) as The Illuminated Rumi and The Illuminated Prayer. Rumi was inspired by his encounter with Shams-e Tabrizi, a Sufi—a person of mystical presence who lived in communion with the essential source from which all religions take their inspiration. Rumi’s life was forever changed by the example and guidance of his teacher Shams and gave rise to some of the most stirring poetry ever written. 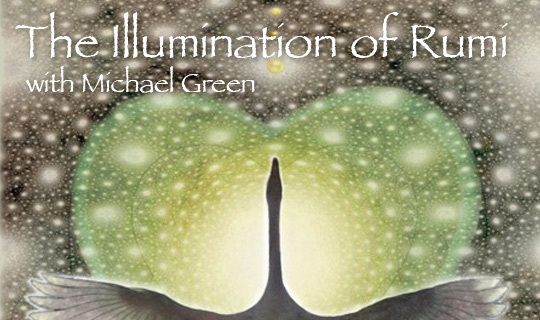 Michael Green comes to Rumi through his own encounter with a 20th century Sufi, Bawa Muhaiyaddeen, a remarkable spiritual teacher who taught throughout the United States until his passing in 1986. Together with his son Kabir, a guitarist, and other musicians, Michael formed the Illumination Band, whose uplifting songs, based on Rumi poems, are also heard in this program. Through Love all that is bitter will be sweet. Through Love all this is copper will be gold. Through Love all dregs will turn to purest wine. A presentation of interviews recorded at the dedication ceremonies of a mosque constructed by a small Islamic community in Pennsylvania. Much in the tradition of ancient Persia’s transcendentalist Rumi, “Ecstasy of the Heart” by contemporary Ceylonese lyrist Fuard Uduman borrows stunning images from nature to depict the inner human quest for God.